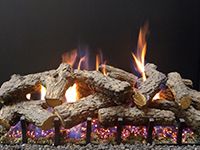 Enjoy the natural and realistic appearance provided by Sierra Gas Logs without the hassle of a wood fire. 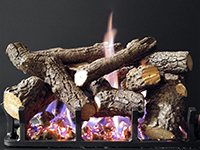 Each log is carefully hand crafted from ceramic materials using actual oak and pine logs. 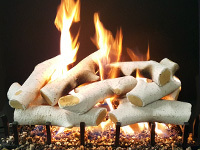 Sierra Logs are produced using high temperature ceramics for maximum durability. Each log is then hand-painted with natural tone colors to generate a realistic seasoned log appearance. Sierra's innovative Ember-Burn system creates a perfect fire effect including large glowing ember bed. Controlling the flame from low burn to a blazing fire is as simple as turning a knob. The advanced patented BI-FLO Burner is the heart of our Ember-Burn taking flames to new heights. Dispersing flame toward the front ember bed and upwards around the logs for the most realistic glowing ember effect. Safety pilot, remote control options, and wall switch and timer are available. Enjoy the natural and realistic look of a wood fire provided by Sierra Radiant Heat Gas Logs without the hassles building a wood fire! Each log is carefully hand-crafted from actual oak, pine, and Aspen logs and duplicated in high quality ceramics. Available in three pleasing styles including Sierra Hi-Country Aspen, Sierra Majestic Oak, and Sierra Mountain Pine, there is a choice to enhance any fireplace décor. 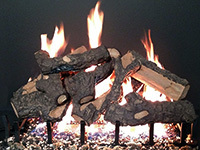 Additionally we provide several Pine Cone kits that add a finishing touch to your fireplace creations. Sierra's patented BI-FLO Burner operates more efficiently, burns cleaner, with lower emissions, and consumes less energy. Utilizing clean burning natural or liquid propane gas, Sierra Logs complies with appropriate air emission standards. Connection Kit: (1) 11" Gas Connector, (1) 3/8" Pipe Plug, (1) NG Gas Orifice Fitting, and (1) Damper Clamp. 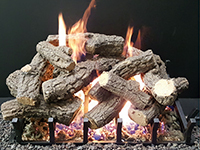 Limited Lifetime Warranty: For the benefit of the original purchaser, Sierra Products, Inc. warrants your ceramic refractory gas logs to be free of manufacturing defects in material and workmanship. Bi-Flo burner components have a five (5) year warranty and valves, pilot and controls one (1) year. Details and proof of purchase form provided with log kit.